As a running back for the Minnesota Vikings, Adrian Peterson has accomplished a lot in the 7 years that he has played in the National Football League. Elected to the Pro Bowl 6 years in a row, Adrian ‘All Day’ Peterson accumulated over 1,000 yards in 5 of the 6 seasons he played, including his MVP (Most Valuable Player) season in 2012 in which he almost broke the rushing yard record of 2,105 yards set by Eric Dickerson in 1984; in the end he was 8 yards short. 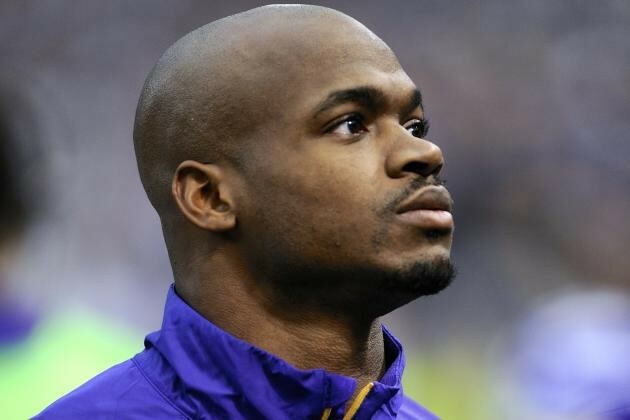 However, despite all of his success and a career that was once looked upon as that of a future hall of famer, all of that is now in doubt due to the current accusations against Peterson in the ongoing trial involving allegations of beating his child. On the 12th of September, Peterson was accused of hitting his 4 year old son and was quickly charged with child abuse. Photos shortly appeared thereafter of the “punishment” that Peterson dealt his son, which quite frankly, look more like deep wounds. Peterson came to his own defence in the light of the news stating that he did not intend to hurt his son like that and he was simply giving him a telling off for bad behaviour. He went on informing the jury and media that he was disciplined by his father in the same way as a child. Once more details of the case emerged, it turned out that Peterson was hitting his son with what looks like a tree branch. After testifying in front of a grand jury in Montgomery County, Texas, the next day Peterson turned himself into the authorities. However, he was later released with $15,000 bail. Upon hearing the news, the Minnesota Vikings acted immediately and deactivated Peterson for the week 2 match up against the New England Patriots on Sunday 14th September. In the weeks that followed, head coach Mike Zimmer, general manager Rick Spielman and owners Zygi and Mark Wilf addressed the media regarding the storylines surrounding Peterson and his future with the organisation. Following this, Peterson went from inactive on the team’s weekly reports to suspended for the remainder of the 2014 season. The Vikings were not comfortable playing a potential child abuser on their team and felt that this would cause an uproar and upset not only with fans and the community of Minnesota but would send an ill-advised message to the rest of the world. The stock continued to drop for Peterson as sponsors such as Nike cut ties with the superstar player and the governor of Minnesota released a statement calling him a public embarrassment. As of April next year, Peterson can apply to appeal his suspension in order to be reinstated for the 2015 season, although it is not clear whether the NFL will allow him to play another down in the league if he is indeed found guilty of attacking his son. If he is allowed to play again, he would probably be looking for another home as it is highly unlikely that the Vikings will continue to pay his high salary despite the talent and leadership he has brought to the team throughout his career. NFL commissioner Roger Goodell has already been criticised for the way he has dealt with previous incidents involving abuse including the recent case of former Baltimore Ravens running back Ray Rice after footage was released of him knocking out his wife in a car park elevator and dragging her unconscious body to his car. Rice was released from the Ravens and is still without a team following a suspension, although there was an investigation launched into the activities of Goodell and how he proceeded to deal with the evidence that was released regarding Rice’s assault. That particular investigation is still ongoing. Posted in Sport and tagged adrian, Football, peterson, Sport. Bookmark the permalink.